Kingpin Manufacturing is a family owned and run manufacturing business formed in 1999. We produce and supply a wide range of Earth Tags, Locknuts and Washers in various materials to suit the Cable Gland industry requirement. Kingpin Manufacturing is managed solely by family, so whoever deals with your enquiry will have the experience and expertise to ensure you receive the speed and quality of service that we pride ourselves on – anything less is unacceptable. To that end, you can see our high standards represented in our ISO9001:2000 acceditation. Furthermore, our years of supplying the cable gland industry with cable gland accessories have resulted in invaluable contacts and knowledge of this highly specialised sector. We believe that gives us an immense advantage over any and all competition. We utilise this experience to give our customers the best quality products, services and prices. Getting the precise part you require is of paramount importance in this industry. That is why the vast majority of our products are custom made to order, machined down to the most minute detail. Anybody who has had to make do with store brought products will no doubt know that having a custom built cable gland accessory is preferable 100% of the time. And don’t worry about the speed of your order – Kingpin have the machinery and tools to turn around your product rapidly, so you won’t be waiting an age for your earth tag, washer or locknut. No matter what part you need producing, Kingpin are ready, willing and able to take the job on, whether it is a one-off accessory or an order numbering in the thousands. We aim to be the number one supplier of cable gland accessories to the industry, and believe we are up to any order that you may have for us. Feel free to get in touch if you would like to enquire about our services. 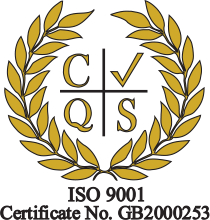 Kingpin has been awarded BS EN ISO 9001:2000.